I know this is straying off topic but how exaggerated do you think the cleaving through helm, coif, and skull is? 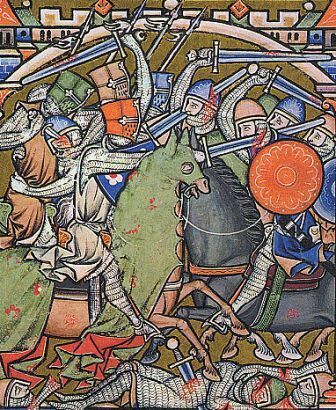 In Usamah ibn-Munqidh's first hand account of the crusades he tells of several instances where swords had cleaved a man in half or hacked him from his shoulder down to his saddle. I realize a mail shirt and bone isn't as tough as a helm, bone, and mail but isn't it plausible that a sword could do that, maybe not as frequently as the Maciejowski Bible but do you think it happened occasionally? Escpecially a nice falchion? Just wondering how far a sword really could cleave. I figured I'd bite at Chad's hint about a new thread concerning J. Bedell's post. I also think it would be interesting to get everyone else's take on this. I'm sure most of us have seen test cutting (if not in person, then though the web) showing a modern sword cleaving through mail (usually butted) and leaving a cut on a pork shoulder or some other medium. It's something else entirely to look through the Maciejowski Bible and see image after image of armored heads seemingly cleaved to the jawline, etc. So what does everybody else think? Is there an overabundance of artistic license from period art? Or what it really commonplace to see torsos and skulls cleaved through so casually? Notice how in this picture two men are being cleaved and there are loose limbs on the ground that have been hacked off. Exaggeration? I would love to hear opinions. Personally I believe it is entirely possible especially since at least one first hand account mentions swords cutting very deep. A nice, hard, well placed swing can do severe damage. Some of what we have is likely artistic license. Isn't there a literary account of someone slicing all the way through someone, through the saddle, and into a horse? That's hard to believe. There's a lot of mail, tissue, organs, bones, fabric, leather, etc. to go through with one stroke. Cleanly chopping through mail to cut off an arm may be a stretch as well. I thought mail was supposed to provide fairly decent cut protection. If someone wants to take a good repro of Type XI, XI, or XII and a good repro conical or great helm and see if a stroke can cleave it like that, I'd be interested in seeing the results. Indeed! The Song of Roland, in particular, is quite graphic in descriptions of the hero doing precisely that. I'm inclined to think that it was artistic license, precisely because the song of Roland presents it as evidence of the hero's unique prowess. I'd expect that if it were common, then the tale wouldn't have made out as if Roland were so exceptional simply because he could do it. However, I do expect that helms were cleaved, mail shivered, and limbs shorn. Just, perhaps, not so deeply or regularly as sometimes portrayed. Maybe the Medieval equivalent of shotguns hits throwing people 20 feet in bad movies ? If the hero can cleave a helm with his sword it's impressive because it was very rare for it to really happen, so being able to do it is what heroes are made of ! Just one possibility ? Maybe in some cases it might happen. Blunt trauma and then finishing off the unconscious or ransoming them probably was more common. I agree. I believe their helmets to be made of rather soft Steel/Iron. During a sword impact the metal tends to fold inwards absorbing the impact and crushing the scull of the wearer. I have a rather old VHS copy of a tempered Japanese helmet being cut. This helmet was stand mounted and cut buy a sword forged specifically for the purpose under ideal conditions. The cut was only about 3.5” long and what looked to be about ~.750” deep. The helmet folded slightly under the impact. I did not appear to cut deep enough to harm the wearer. However the impact is a different story what a head ache ouch!!! It became quite clear in some recent testing of mail (albeit not riveted and made from modern materials) that the stuff is difficult to damage let alone cut through. But he bear a basilard. I've done some very, very crude cutting tests on my own butted mail laid out over wood, with no padding. Even in this case, where there is no padding, the rings aren't riveted, etc., the blade I was using was hard pressed to shear off the rings. Had I used a larger, sharper sword I'm sure it would have been easier-but under battle conditions the target would have padding and presumably be in motion, thereby making it very difficult to land the "perfect blow" that you can on a stationary target. Oh...and I think I read somewhere about Brian Boru using his sword to cut 3/4 of the way through the neck of an oxen. Sorry, don't have a reference for that (might have even been in a recent fictional work). Just thought I'd share that for whatever it's worth. It was a two handed sword but I don't remember what type it was supposed to be. What would an illustrated Old Testament Bible be without plenty of smiting and cleaving? Mind you those big two handed straight handled falchions look like they could do some serious cleaving. There was a recent show(well about a year ago) on the BBC where it tried to demonstrate a sword cleaveing through a helm. Both sword and helm where made to period specifications ( I think it was early Saxon) so a brand new helm which was sitting static and a brand new sword where used to test this . Altough the blows made several dents in the helm it was unable to find enough purchase to cut through. i think the amount of force it would require to cut through armour plus a human torso is unrealistic and the actual fact that this event is documented would lead me to believe that these wounds where exceptional and therefor worthy of recording, Damn I wish I could remeber the name of the program. I will have to look for the primary souces on this, but the account of a knight slashing though another ride to the saddle I have seen. The rider was a Saracen archer if I remember correctly who, fhran what I have read, wore very little armor during the first crusades when this event supposedly occurred. From what I remember the cut went from the shoulder to the saddle. Could this have happened? I am not really sure but I am inclined to believe terrible cuts could be made to an unarmored apponent when charging at him from a warhorse. I ma sure some artistic license was taken for medieval illustrations. Perhaps the artists had never actually wittnessed the events they were depicting. I don't think these kinds of cuts would have been maed on an apponent wearing maile. We have come to find out that maile was very tough indeed. I have to agree with the common consensus here. No way in the world a sword can cleave through mail under battle conditions, unless the mail is very poorly made. Heck, I don't think Mariusz Pudzianowski or Arnold Schwarzenegger could cut through a decent mail shirt, and it was impossible for anyone in the medieval period to have the level of strength (*cough* steroids *cough*) those guys do. Also one of these long deep cuts would have to cut a couple of feet of maille and not just a few links. Even if cutting a few inches long is possible the cutting edge would not be able to get very deep or even cut, a gambison under the maille should be able to limit the damage to a superficial wound at worse. The blunt trauma might still incapacitate though. A trust that does manage to burst even one link might might let a narrow blade through: Sword, spear, arrow, rondel dagger ....... whatever: Instead of many inches or feet of cut maille links only one link or a small number of links need be cut ! That at least sounds possible with all the energy hitting the same small spot instead of a long line. All sorts of variables there from quality of maille to quality of sword, skill and strength could give very different results. Seriously, I think it could have happened, but you'd have to be very lucky to do so. There's more than just flesh between the shoulder and the saddle - bones, clothing, organs etc. It might be a bit easier if the person were unarmored and leaning forward, over the saddle. You don't necessarily have to through their torso the long way, I think. Once through the bone of the spine, there isn't anything but soft tissue to cut through, so I could see this as quite plausible. I doubt that the oxen was armorered. As noted in other threads, living bone is much less "hard" than dead bone and would be easier to cut through than that of a corpse/butcher's cuts of meat--perhaps the consistency of a green branch of a similar size. I agree that it would be difficult to cut through maile (though difficult doesn't mean impossible--at least local failure of some rings), but that certainly doesn't discount compound fractures and broken links tearing into the flesh--perhaps even severing the limb due to the damage without the sword doing the "cutting". All of the energy of the swing is going somewhere--it just doesn't stop cold against resistance. After holding and swinging the SOSMT, I see how it could cause catastrophic damage with the momentum of the horse behind it, should it break through the initial resistance. I do not have the source at hand, but there is at least one account of dismembered bodies, and bodies cut in half during the Scot rebellion in the 1740s. “On the morning after the battle - for night had thrown its curtain over the horrors of the scene, before the extent of the carnage could be ascertained - the field of battle and the ground between it and the river, extending as far as the pass, presented an appalling spectacle in the vast numbers of the dead which strewed the savage and unrelenting ferocity with which Mackay's men had been hewn down by the Highlanders. Here might be seen a skull which had been struck off above the ears by a stroke from a broad-sword - there a head lying near the trunk from which it had been severed - here an arm or a limb - there a corpse laid open from the head to the brisket; while interspersed among these lifeless trunks, dejectaque membra, were to be seen broken pikes, small swords and muskets, which had been snapped asunder by the athletic blows of the Lochaber axe and broad-sword”.